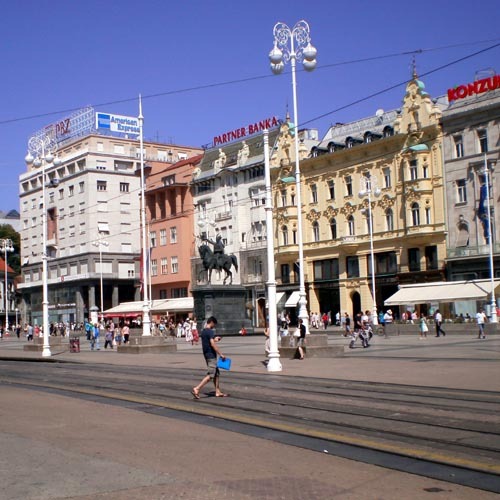 Jelačić Square is the centre of downtown Zagreb, and the traditional meeting place for citizens of the capital of the Republic of Croatia. The statue of Josip Jelačić, seen in the background of the photo, is a kind of symbol of the changes Croatia has gone through in its recent history. Erected in 1866 by the Austrian imperial powers, it was removed in 1947 by the new Communist Government of Yugoslavia. Then, in 1990, when elections were held and Yugoslavia was split into Croatia, Serbia, Bosnia Herzegovina, Macedonia, Montenegro and Slovenia, Josip Jelačić was rehabilitated and his statue returned to the square. Jelačić was the son of a Croatian Baron and joined the Austrian army, soon progressing through the ranks. A controversial figure, he supported separation of Croatian provinces from Hungary, and abolished serfdom, but was also responsible for putting down any opposition ruthlessly, with many executions. At Christmas the pedestrianised square is filled with Christmas trees and lights.